It used to be said that footballers would be accommodated at full-back, that it was somehow an easy position to play because getting forward was a bonus but defending was limited to when attacking play comes down your side of the pitch. If that were ever to be true, it’s certainly not now. Look at the task for Leicester City against Chelsea in The Premier League. The map illustrating where Jose’s widemen received the ball against Burnley earlier this week is more frightening than the cost of a post-match pint on the King’s Road. Chelsea seemed to ease off against Burnley in their opening game of the campaign when they were three one up. They touched fourth gear for what seemed 25 minutes, enough to remain comfortably in the lead and secure three away points. At Turf Moor, the Premier League favourites successfully completed 166 passes in the final third whilst Leicester City, albeit against different opposition, managed 100. 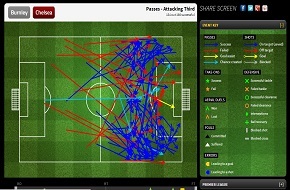 The Cesc effect you could say with Fabregas purring as he stroked the ball more than any other player on the field. 105 times plus one WOW factor ball which requires an asterisk in itself. £32m Edin Hazard and £18m worth of Andre Schurrle providing that width means there’s no place for hiding on the field. Full-backs are not accommodated, they’re vital members of the squad in The Premier League and deserve the same focus as any other position. Picture courtesy of 442 magazine.